Siegmund falls early; the Met revives Die Walküre. 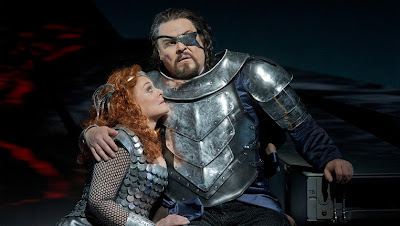 Wotan, (Mark Delavan) Brünnhilde (Deborah Voigt) and (at right) a plank of the "Machine." Scene from Act II of Die Walküre. Photo by Ken Howard © 2013 The Metropolitan Opera. There were no technical problems with Saturday morning's matinee performance of Richard Wagner's Die Walküre. In fact, the Metropolitan Opera's revival of the second chapter in Robert Lepage's production of Der Ring des Nibelungen went off without a glitch from the "Machine," the 45-ton set that occasionally upstages the gods and mortals that inhabit this mythic German drama. On Saturday morning, the problem was...allergies. At the start of the show, Met general manager Peter Gelb announced that New Zealand-born tenor Simon O'Neill was suffering a "severe" allergy attack. Although he intended to sing, the audience's indulgence was requested. Mr. O'Neill was onstage for the first scene of Act I, singing with pleasing tone despite his ailment. His replacement (and countryman) tenor Andrew Sritheran quickly made his house debut) slipping onstage before "Wälse, Wälse!" He proved to be more than adequate, with a bright voice that had a brassy gleam. Its upper regions may be better suited to Siegfried. Happily, Mr. O'Neill and Mr. Sritheran were matched with Martina Serafinmaking her house debut as Sieglinde. This Austrian soprano sang the part of Siegmund's beleaguered sister with secure high notes, rising to an ecstatic climax as Mr. Sritheran drew the sword from the tree. Her dusky bottom range served well in her Act II monologue. The voice bloomed and swelled in "O hehrstes Wunder!" Sieglinde's final address to Brünnhilde that foreshadows the ending of the entire cycle. Deborah Voigt remains a less than perfect Brunnhilde, although there is evidence of improvement. She now climbs onto the Machine from upstage, although there is still evidence that the soprano is not comfortable moving around on the contraption in a long Valkyrie skirt. The opening "Ho-jo-to-hos" revealed a voice is fairly strong in its upper register, although the highest notes come out short with a lack of diaphragm support. She has worked hard on this part in the last two years, as evidenced by the care and thought put into the Annunciation of Death scene in Act II and her long dialogue with Wotan (Mark Delavan) at the end of the opera. If anything, she is wholly committed to the role of Brunnhilde. Hopefully that will extend to strong performances the last chapters of the cycle. At first, there was little difference between Mr. Delavan's Das Rheingold Wotan and the older (and ultimately, sadder god in Die Walküre. The bass-baritone sang with a dark, potent tone, although he had to compete with an unrestrained orchestra in the "Götternot" portion of the Act II monologue. He was at his best in the quiet, reflective passages, drawing the listener in to the God's eternal conflict despite the distracting prop of Wotan's other, glowering eye flickering from under the planks of the Machine. When Wotan turned angry, Mr. Delavan injected his long experience of onstage villainy into the performance, slaying Hunding with a snarled "Geh!" and roaring onstage in the third act. This tantrum made his farewell to Brunnhilde all the more poignant. In the Magic Fire scene, the bass sung the final words in a full, commanding voice, drawing out the last note over the orchestra in a display of vocal showmanship. Fabio Luisi's conducting finally released the pent-up emotional charge of the music at this point. Stephanie Blythe remains a formidable Fricka, cowing her husband into submission despite being confined to a ridiculous sliding throne. Hans-Peter König is a fatherly, almost jolly Hunding. (The real menace coming from his gang of Neiding hunters marauding between the Machine-generated trees.) An all-star cast of up-and-comers (including Eve Gigliotti, Wendy Bryn Harmer and Jennifer Johnson Cano) made the Ride of the Valkyries an aural and visual treat, just as Wagner intended.